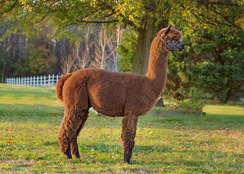 Femme was an auction purchase for us several years ago and has been a consistent producer of beautifully colored cria. Out of Chieftain, Femme delivered a medium brown boy who was a multiple blue ribbon winner in all three age groups and finished out his show career with a Color Championship as an adult male! 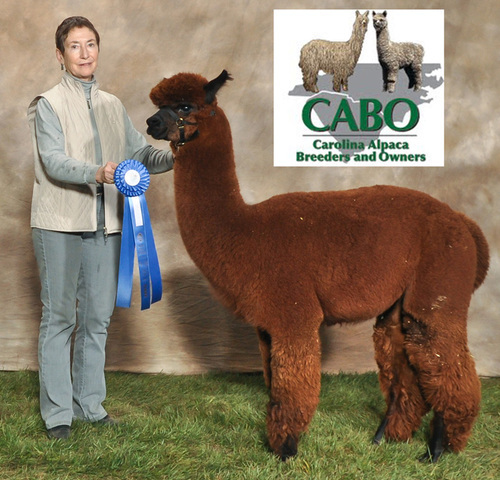 Now the Color Champion from the 2012 PAOBA Breeders Showcase, Baron just keeps getting better with age! The judge was thoroughly impressed with the combination of his fineness, density and consistency of crimp. Out of a gray dam, Baron is a rich mahogany brown with the kind of fiber you expect to see on a fawn (thank you, Chieftain!). Baron has been evaluated by five different judges and placed consistently in the top three in four different states. 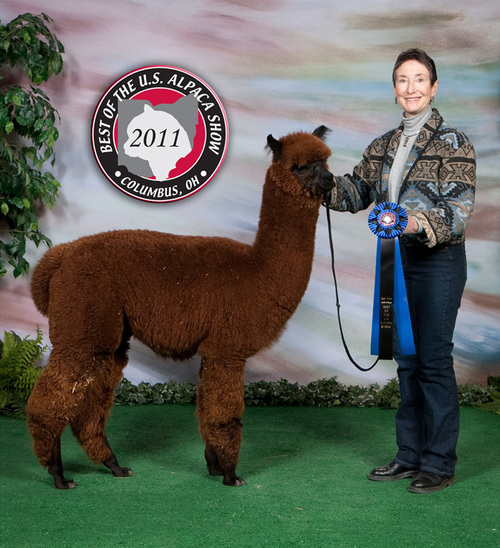 He was also part of our Breeders Best entry in Georgia that won the blue ribbon. 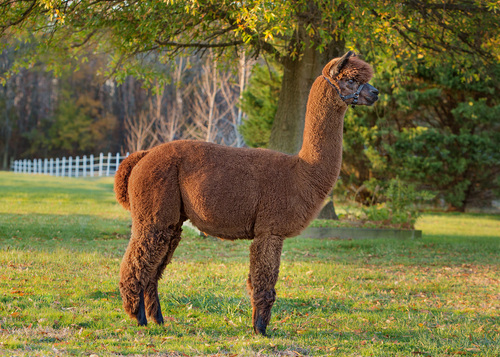 With a combination of fineness, density, and beautifully consistent crimp, Baron is a guy who can earn a spot in someone's herdsire row. He has lots of color in his background, covering both black and gray. 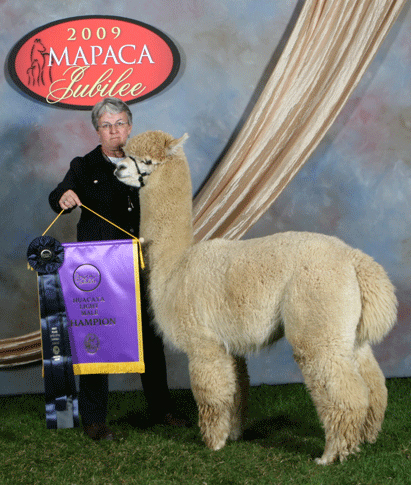 His sire Chieftain has maintained his fineness for four years with virtually the same histogram he had when he won his first banner. 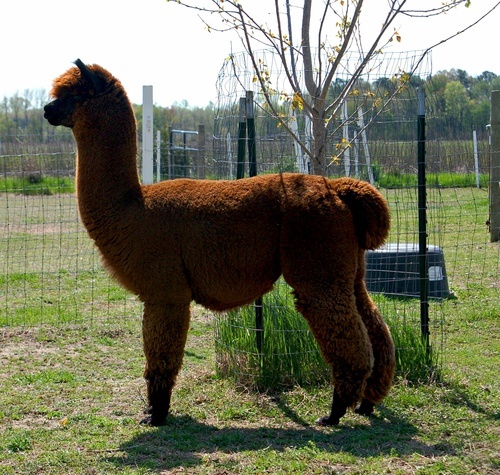 Baron is started out with a great 17 AFD, especially considering his dam is gray. Now, as a 24 month old, he's paying attention to the girls and still winning blue ribbons. His 2012 Spring show season saw him win three blues and a banner against tough competition in the South, PA and Ohio. Solid, solid fiber characteristics and conformation...at a great price. Don't be fooled by the price. Baron is ready to start his breeding career and needs to find a home where his Dad isn't standing in the pasture beside him. 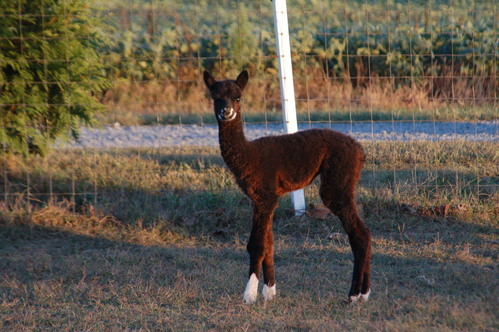 Baron is now a proven male, with two stunning dark brown FEMALE cria to his credit ! Flashy girl with Champion Genetics !